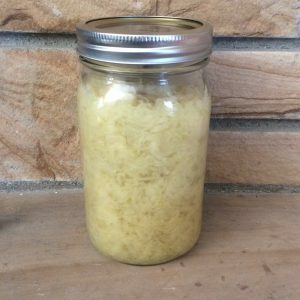 Teeming with life and full of bubbly deliciousness, sauerkraut is digestive vigor in a jar. When made at home, sauerkraut is inexpensive and simple to prepare. One head of cabbage yields about a quart of sauerkraut and trillions of beneficial bacteria to supplement your gut flora. Cabbage is high in glutamine, the predominant amino acid composing the intestinal lining, making sauerkraut an excellent remedy to repair a loss of gut integrity (colloquially referred to as leaky gut). Use green cabbage, preferably organic and locally grown. If fresh, notice the white sheen on the leaves. This is a biofilm of Lactobacillus, the bacteria responsible for lacto-fermentation. You can get creative beyond this basic recipe by adding different vegetables. Accent your kraut with thin slices of carrots, shredded kale, chopped garlic, or chopped ginger if you prefer a spicy kick. The possibilities are seemingly endless and present an array of different flavors and nutrients. Start by peeling off the large outer leaves of the cabbage, discarding the damaged or wilted ones and reserving a few unblemished leaves for later. Quarter the cabbage and cut out the tough inside core, leaving a slightly hollowed out cabbage wedge. Use a sharp knife to slice the cabbage into thin strands. Place the cabbage into a large bowl and add sea salt to taste. You can forgo the salt if on a sodium-restricted diet; however, salt hastens the fermenting process by drawing moisture out of the cabbage while suppressing mold growth until the Lactobacillus bacteria can acidify the microenvironment. In place of salt, you can use a few tablespoons of fresh whey (obtainable by straining yogurt) to inoculate the culture and inhibit mold. After adding the salt, pound the cabbage with the head of a mallet or grab a handful at a time and squeeze until liquid forms, typically 10 minutes. Both methods work well and have the added bonus of relieving stress and frustration as you pound or squeeze. Once you have a fair amount of liquid in the bowl, stir any additional desired ingredients. Use a spoon to fill and tightly pack the cabbage into one or more wide-mouthed canning jars, leaving about 2 inches of space at the top. The liquid should be sufficient to completely cover the cabbage. If not, add a little water and a pinch of salt. Before sealing, fold the reserved outer leaves into wedges and press them on top. These leaves will be discarded when the jar is opened but hold the sauerkraut down to prevent it from floating above the liquid and deter mold growth from contact with the surface air. Make sure to leave at least an inch of air space between the leaves and the top of the jar. The sauerkraut will rise as air bubbles form and push it up a bit. Without the headspace, the contents will bubble over and leak out of the jar. Seal the jar tightly with a canning lid and screw-on ring. Leave the sealed jar on a counter for three days before moving it into cold storage, such as a root cellar or refrigerator. If the sauerkraut is looking particularly vigorous, place the jar in a pan to catch the erupting liquid. Naturally, this tends to happen while you are sleeping or otherwise distracted and not checking on your ferment. You can eat the sauerkraut after three days, although the flavors will mature over the course of weeks. During that time, the cabbage fiber will continue to be broken down as the microbes flourish, rendering it easier to digest. Once opened, refrigerate the sauerkraut and consume it raw after discarding the leaves you pressed on top. One thing you should NEVER do is heat sauerkraut. Heating destroys the probiotics that you worked so hard to produce. Before our modern understanding of microbiology, fermentation was utilized as a means to preserve food. We now know the same microorganisms that inhibit spoilage fulfill a millennia-old symbiotic relationship with humans. Although we can influence that relationship with probiotic supplements, fermented foods and drinks are advantageous due to their potency and low cost.